AT&T will offer the HTC One mini starting on August 23 both online and in stores. For now, the 4.3-inch smartphone is exclusive to AT&T and costs $99 with a two-year contract. Yesterday, AT&T confirmed in a press release the arrival of HTC One's smaller version on its network. The Snapdragon powered 4.3-inch HTC One mini will be available as an AT&T exclusive starting on August 23 for a very attractive price. Additional features include GPS, accelerometer, compass, Beats Audio sound enhancement and even some found in the HTC One flagship, such as HTC BlinkFeed or HTC Zoe, thus offering a lot for such a small handset. Priced at $99 with a two-year contract, the HTC One mini is available in Glacial Silver or Stealth Black. 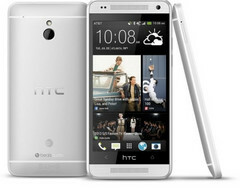 AT&T* announced today its plans to launch the HTC One mini, a compact version of the award-winning HTC One. The HTC One mini shares the iconic design and must-have features of the HTC One and will be available exclusively from AT&T beginning August 23 for $99.99 with a two-year agreement. To see the HTC One mini in action, check out this video. Shorter, thinner and lighter than the original HTC One, the new HTC One mini boasts a striking aluminum body with a 4.3-inch Super LCD 2 HD 720p display, a powerful Qualcomm® Snapdragon™ 400 dual-core 1.4 GHz processor, and HTC’s UltraPixel Camera with backside illuminated sensor that captures 300 percent more light than traditional smartphone camera sensors, so you can take better photos in low light and bright light. HTC BlinkFeed™ puts your favorite content at the center of your mobile world, delivering social updates, news updates and photos directly to your home screen. It aggregates the freshest content, with more than 10,000 feeds served up daily from the most relevant and interesting sources. Enjoy all the information at a glance, without the need to jump between multiple applications and websites. HTC Zoe™ brings special moments to life in three-second videos, enabling a range of advanced editing capabilities and creative flexibility. Photos, videos and Zoes can also be featured as part of automatically edited 30-second Video Highlights with pre-selected themes with music or using sound tracks from your personal music library. HTC BoomSound™ provides dual front-facing speakers and a built-in amplifier to bring music, movies and games to life with minimal distortion, as well as the authentic sound experience you expect from built-in Beats Audio ™.